Every year, hundreds of thousands of Christian pilgrims visit the Church of the Holy Sepulchre (as it is known by Protestants) in Jerusalem. 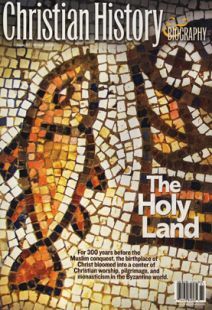 Historians and archaeologists increasingly support its claim to be built on the site of Jesus’ burial. But the church we see today is not the original church built in Constantine’s era, and the site has seen tragedy and tensions for 1400 years. When the Persians invaded Jerusalem in 614, they set the Church of the Anastasis, or Resurrection (as it was then called), on fire, killing countless priests and deacons who had taken refuge there. The Byzantines retook the city promptly, expelled the Persians, and restored the church. The first Muslim conquest in 638 was utterly different. Caliph Umar refused to pray in the church out of respect, lest it be turned into a mosque, and so the church was spared. Four hundred years of uninterrupted devotion continued. But in 1009, an Egyptian Fatimid ruler, al-Hakim bin-Amr Allah, ordered the complete destruction of the church and its sacred tomb, despite the complaints of his mother and sister, who were Christians. Within three years, the caliph relented and permitted Christians to rebuild the church. Even al-Hakim's mother (Maria) came to Jerusalem to aid in the work as compensation for her son’s madness. This rebuilding essentially gave the church its present form. Almost all of what can be seen now stems from this era, rather than the era of Constantine. When the Crusaders arrived in 1099, they increased the adornment and strengthened the church's walls. They added chapels, enclosed the rock of Calvary, and built the sanctuary just east of the tomb— the Katholikon—for services. It was a breathtaking feat of medieval engineering at its finest (domes and illumined ceilings), which fixed the shape of the church for the next 850 years. But during those centuries, the Church of the Holy Sepulchre has also been a source of deep and sometimes violent rivalry between Christians. The Greek Orthodox, Armenian Apostolic, and Roman Catholic churches—and later the Coptic Orthodox, Ethiopian Orthodox and Syriac Orthodox churches— have struggled to share its holy spaces. Conflict was so acute in the 19th century that in 1852 the Muslim Sultan Abd al-Majid I issued an edict called “the Status Quo,” declaring that the spaces held that year by rival churches could not change. No doors, no windows, not even a ladder could be moved. (The ladder you see in the upper right window in photos has been there for over 150 years!) This edict was affirmed by the British in 1917 and by the Israelis in 1967. But distrust continues. Some priests are locked in the church each night just to make sure nothing is removed from their chapels. Muslims have controlled the entrance to the church ever since the Crusaders were driven out in 1187. Today, a Muslim family holds the key.